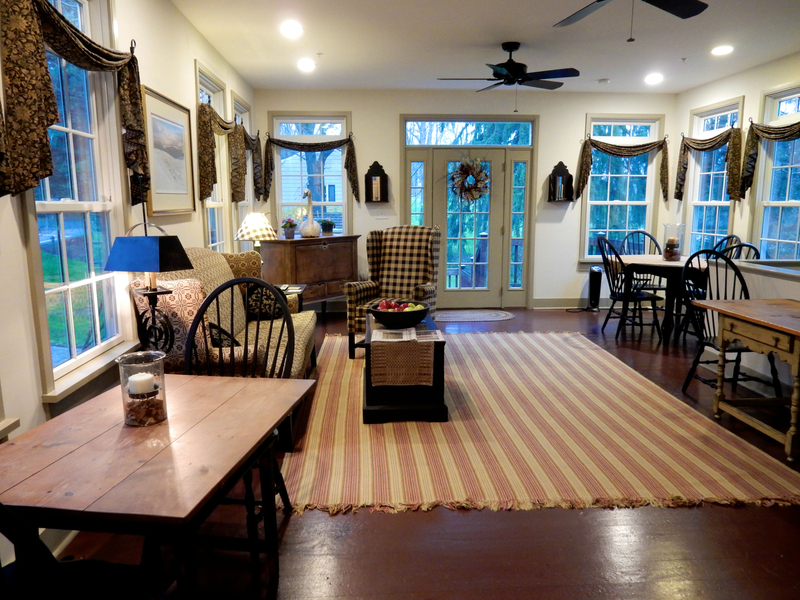 There’s something wonderful about Maryland inn owners – they are an enthusiastic bunch. And you can’t get more exuberant than Dave Balderson, who with his wife, Susan, purchased a private 1780 stone home in the 1990’s and turned it into what is now The Wayside Inn. 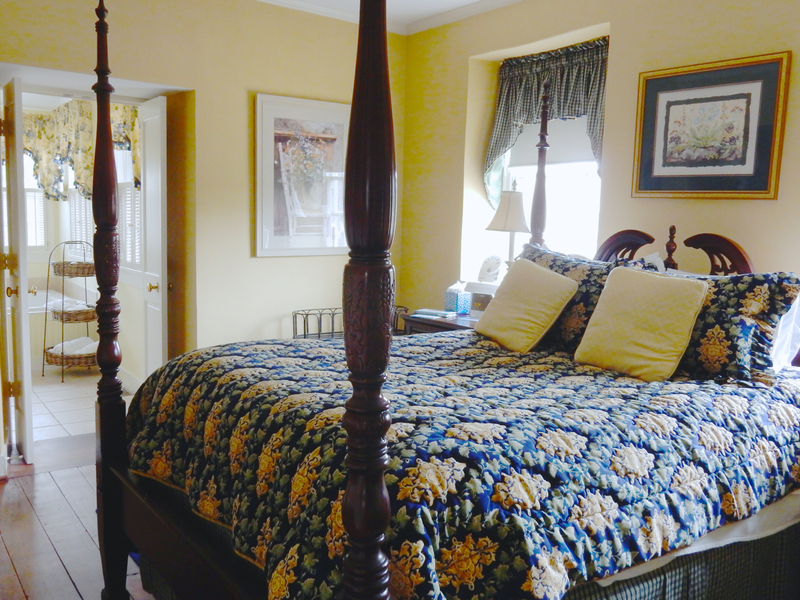 Unlike a turnkey B&B, The Wayside Inn, on the Select Registry, required extreme infrastructure renovation. So the Baldersons stripped the 60’s décor, uncovered original floors and architectural elements, hired an interior designer to find authentic and reproduced Colonial-era furnishings, and painted walls in Benjamin Moore Williamsburg Collection hues. 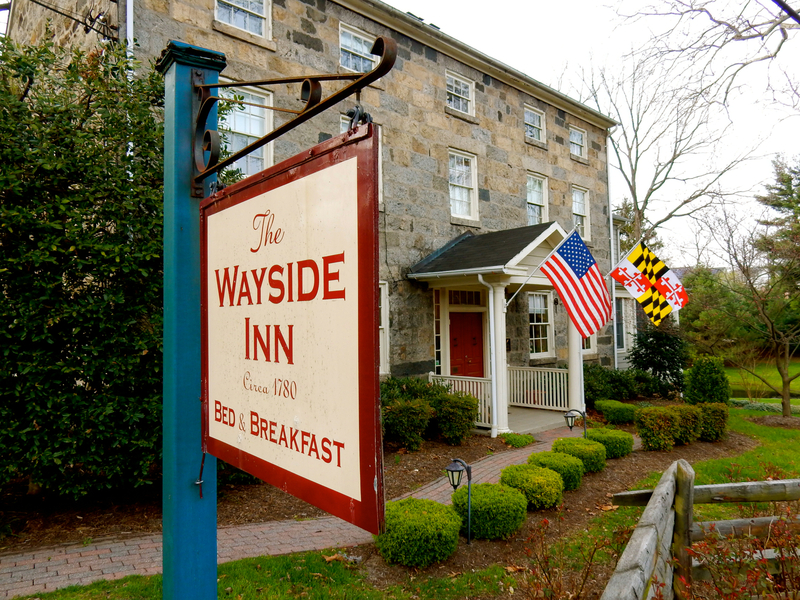 The Wayside Inn opened in Fall 1999. In 2008, the Baldersons enclosed the back screen-in porch, creating a bright year-round Sunroom. Susan, a Justice Dept. bankruptcy CPA, leaves the running of the inn to Dave, as 18 years with McCormick Company’s Hospitality Division has provided him with culinary and marketing expertise. Dave certainly knows how to spoil both overnight visitors and long-term guests who work in nearby Baltimore. 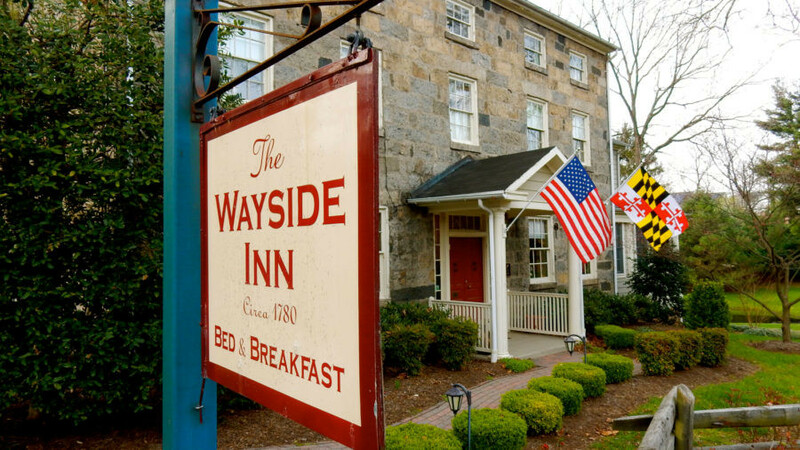 You’ll know you’ve arrived at Wayside Inn as soon as you see it. On a busy road lined with modest homes, this stately stone building stands out, as does the greeting you get from Dave as soon as you walk through the door. 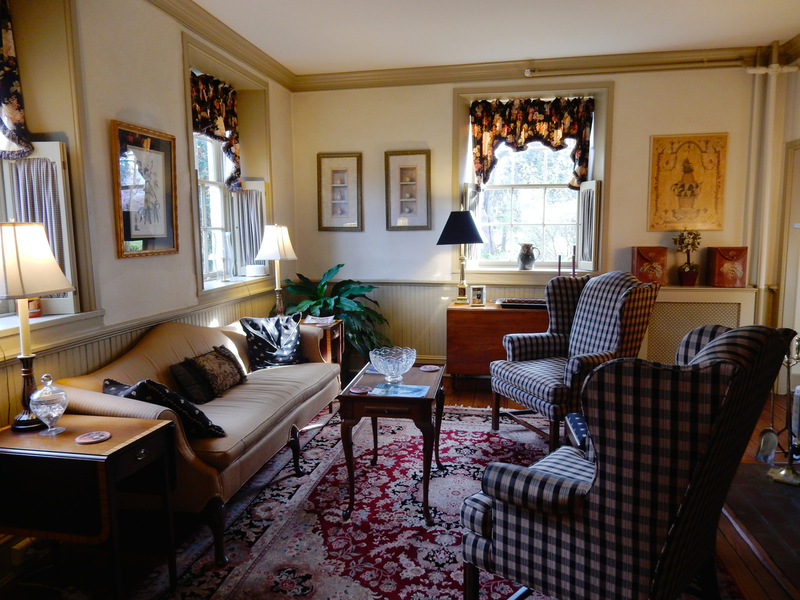 The host’s warm and high-spirited demeanor is just as much a reason to visit as is the inn’s location (two miles from Historic Ellicott City) and its lovely interior. Common rooms are Federalist-chic, with upholstered wingback chairs in plaid prints, wooden spindle seats, and floral rugs. The large dining room table, in smooth dark wood, was actually made custom for the room, but wouldn’t look out of place in a 1700’s home. 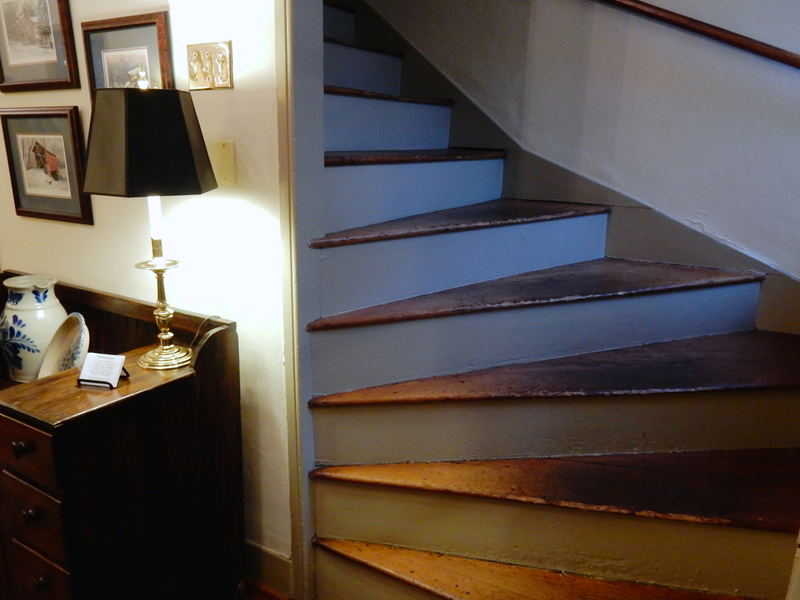 The original staircase bears the mark of centuries; its narrow steps bowed and worn from over 200 years of use. If only these floorboards could talk…. You need a running start to hop into the carved four-poster beds, topped with rich dark floral bedspreads and those oh-so-soft and cosseting “Comphy Sheets.” Botanical prints and other period art hang on walls painted in Williamsburg shades. Naturally, there are ample outlets and a flat-screen tv, though you may want to unplug and enjoy the historic ambience. Bathrooms are modern, with Italian terra cotta tiled rain-showers and modern amenities. With his McCormick background, Dave certainly knows how to spice things up at breakfast: usually something sweet (fresh berries) followed by savory (eggs your way). A hearty start to the day. 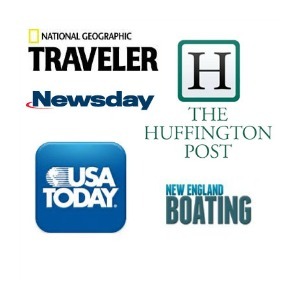 Room rates from $159-$219 include wi-fi, parking, water and hearty hot breakfast for two. For more information about what to do and where to eat in Ellicott City, MD, check out GM’s post HERE.